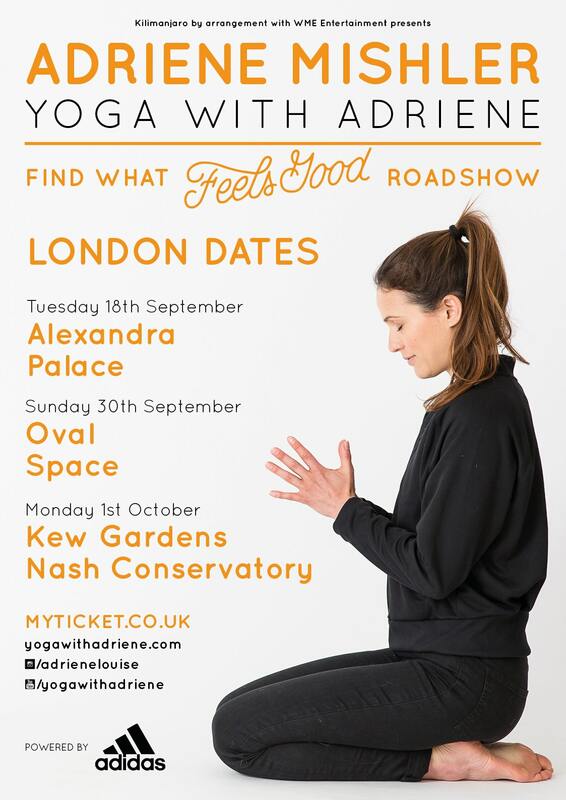 An unforgettable day: Yoga with Adriene’s workshop, London <3 – Reflecting on well-being. It’s one of those weird nights- earlier I was feeling extremely low and lonely, but right now (at almost midnight) I feel a new lease of energy and positivity and I want to use it to speak about an incredible day I had on Sunday. Adriene Mischler is a role model of mine. She’s a yoga instructor with a channel on Youtube called Yoga With Adriene. Her outlook on yoga, and life generally, is one worth listening to, and her style is truly unique. Yoga is often taught as a rigid, precise practice, with instructors often telling you what to do and correcting you, making you feel as though you’re not doing it right. Although postural work and alignment is important, Adriene spreads the word that it isn’t about the shape, it’s about finding what feels good. Moving in a way that feels right for your body, and tuning in to being present and attentive to what you need in that moment. I have never come across anybody like her and this is why I feel she has such a mass following. A year ago, I never would have thought I’d consider going to London on my own, or even get a train anywhere. Doing an internship throughout the summer which I had to commute for increased my confidence and has made me more open minded about opportunities, and this was definitely not one to miss! Recently Adriene has been doing a workshop around the world, and it was announced that Adriene would be coming to London to do a workshop! The first one at Alexandra Palace a few weeks ago had 2000 attendees! How incredible. I was aiming for that one but it was sold out- I’m glad I didn’t get that one though, because a more intimate experience of 200 attendees was to follow.. Initially, when I came across it, I dismissed it. “It’s too far into London”, “I don’t want to get the tube”, “It’s not worth the anxiety”. This is largely why I didn’t want to go to the first event because it was quite late in the evening. But then another date was announced for Sunday just gone- one at 11.30 and one at 4pm. I tried to get the 11.30 but it sold out quickly- I knew I had to act fast and so I ordered my ticket for 4pm. On Sunday, sitting on the train waiting to take off to London, it was slowly starting to sink in that I would see Adriene in the flesh. I got there super early and came across another yogi and we went for a coffee before queing. Can you believe it…I got a place in the front row! Adriene has a great team behind her- they all welcomed us in with open arms and were extremely friendly. We all lined our mats up. So many intricacies were a delight to see- Adriene spoke about in her weekly email that she always makes sure flowers are at her classes, and there were two giant vases with some beautiful blue flowers inside- sitting down it was wonderful catching a fresh scent of them every now and then. The music was delightful- peaceful. Looking around, it felt so surreal. A community of passionate, down to earth yogis, all coming together to enjoy spending time with a wonderful woman. She’s so down to earth- she just appeared from the side door and stared at us, looking at us in awe as we cheered and clapped, welcoming her on to the stage. She immediately spoke about the importance of just taking a moment to be present and absorb the environment we were in. She was just as I expected- humble, warm, and loving. I witnessed this through her existing videos, but feeling it in the flesh was another reality that will always remain in my heart. She has the perfect balance of qualities- she’s goofy and funny, and hearing the whole room burst out with laughter at some of her comments was a delight. I felt like I was in harmony, singing a synchronised song with everyone around me, and Adriene wasn’t superior to us, she was with us, by our side. I hope this doesn’t sound like some obssessive fan girl stuff! But it’s impossible not to speak of her in this way. Of her content. Her message and her wisdom. A moment that stood out to me was when she invited us to take a seat, close our eyes, and take a deep breath. At that moment, in such a meditative state, I started to cry. Before that moment she spoke about how she isn’t here to correct people, how even if we spent the entire class in shavasana doing nothing it didn’t matter, and if we wanted to have a cry, that’s okay too. I’ve never felt comfortable crying in public before, but her warmth radiated across the room, and I was comfortable and vulnerable enough to let it out. I cried, because I realised that I’d never felt less alone. I have anxiety and depression and loneliness has been a big struggle for me- and feeling this sense of connection to so many strangers, and sharing such an intimate experience with the one yogi I’ve wanted to meet for ages was just such a privilege, and I felt supported. I felt loved. This can only be understood once one immerses themselves in her content and absorbs the knowledge she spreads around the world. It’s difficult to get across with the written word. There were a number of things that stood out to me that day. She discussed how we’re so focused on seeking what we need from other people, without realising that everything we need is within us. When things get difficult, such as at the moment finding employment, it doesn’t always feel like a helpful or tangible idea, but it doesn’t make it any less valid. Through the past few years I’ve been so focused on what I’m dissatisfied with in my life, how everything is wrong, and everyone lets me down. Without paying attention to the love that is inside of me, that I can use for myself. I do believe in this notion and I try to remind myself of it. Sarah Bowman runs a community of yogis that follow Adriene’s content online- she’s equally friendly and down to earth, and is one of the main reasons the online forum feels so community oriented and genuine. She was there, and seeing her in the flesh felt like a privilege, it was overwhelming. I really wanted to say hello, but I just didn’t feel able. Either way, it was a true pleasure to be in the same room as such an inspiring soul. There were also moments where Adriene would guide us to inhale and exhale together- hearing the whole room sigh together was a surreal feeling, it felt so warm and loving. There’s also a song that’s always played at the end of Adriene’s youtube videos- and at one point mid flow, she said “I think you’ll recognise the next song”. When it came on, I was filled with happiness. Just reaffirming this strong sense of community, and again because it is all online it felt so surreal to experience it in person with her and other yogis. There was one flow we did that I found particularly empowering. We placed our feet as wide as the yoga mat, and flowed between goddess pose, and star pose. It gave me that elegant yet warrior-like feeling I get when I do poses like warrior 2. We were all turned to the side as well, facing the window, and it was such a great feeling to look around and see us all moving together in such a peaceful, synchronised fashion. At the end, before bowing and saying Namaste, Adriene invited us to turn to our neighbour and touch their shoulder. Again, such an inspiring, intricate touch that reinforced this feeling of unconditional love and togetherness. Never before have I felt so connected to a bunch of strangers! I wanted to write about this day, because it was so moving and so powerful for me. I struggle so much, battling with my mind, my thoughts, my feelings, my frustrations and bitterness. But somehow, in that room and with the love that was cultivated, all of those feelings became insignificant and I just felt safe and reassured. This is what yoga is about. It’s not about the pose, the shape, the advanced practice. It’s about community. Cohesion. Peace. Cultivating a positive relationship with yourself. This is why Adriene is not to go unnoticed. It still hasn’t sunk in that I saw her in the flesh and did yoga with her. I also wanted to share a video I discovered today where she was interviewed, take a look! Gosh, this was a long post! Previous Diary: Rejection, loneliness, depression. Next My Yoga today: Freedom and Forgiveness.